My students often lament that they cannot mix any color they want from a so-called artist kit of pigments brought from the art shop. It is little wonder when I see the range of colors supplied. More often than not, you will find a ‘red’, ‘yellow’ and a ‘blue’ of some sort. You will also find a brown or a range of browns, a black, a green and (incredibly the same tube size as the other colors of) titanium white. It is little wonder that the beginner in oil painting or acrylics cannot mix the colors desired. This is because, for starters, the misconception of what a primary color is. You see, it is believed that any color can be mixed by the inclusion of red, yellow and blue in the kit. 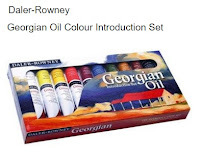 But some reds, yellows and blues are not primary colors. Cadmium red is not a primary color because it contains a lot of yellow. Thin this pigment down and you will see a slightly yellowish tinge in the wash. A clean purple cannot be achieved by including cadmium red in a red/blue mix. Similarly, ultramarine is not a primary blue as it contains a lot of red, bringing a violet hue. Therefore clean greens will not be possible by including this color. An artist kit is only as good as the vibrancy of secondary colors it can bring. These are violet, green and red (orange is in fact a tertiary color). Overly bright secondary colors can always be muted down by adding brown or an opposing color, cannot be made more ‘bright’. The primary colors are cyan, yellow and magenta, not any red, yellow or blue. Another problem is black. I say black, because I do not understand why black is included at all, except for a monochrome project. Black can be achieved by mixing any red, yellow and blue and is seldom needed in everyday art. And why would black be added to any color, except to create unconvincing shadows or to dirty a color. The same applies to ‘yellow ochre’ and ‘sap green’. Because of their association with the old masters, modern artists believe these pigments to be vital to any pigment selection. I personally find them useless and dirty. And finally, the most important pigment of all: titanium white. 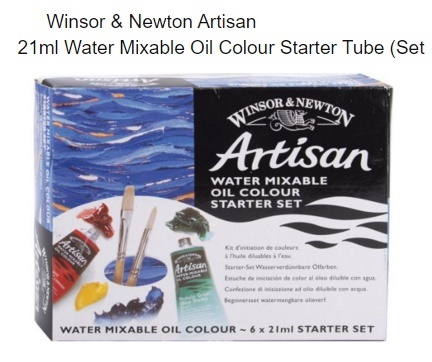 Why do these artist kits include white of the same tube size as the other pigments? Colors can be darkened by adding its complimentary color (the opposite color, for example by adding violet to yellow). But a color cannot be lightened without white. Lightening a color forms a fundamental part of color mixing. 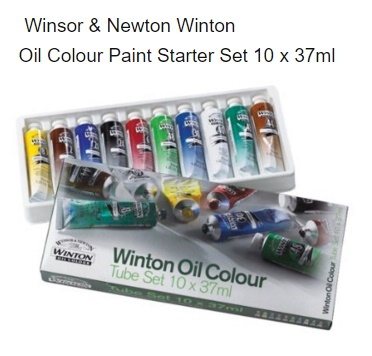 And yet the artist kit often contains the same tube size of white as the other colors. 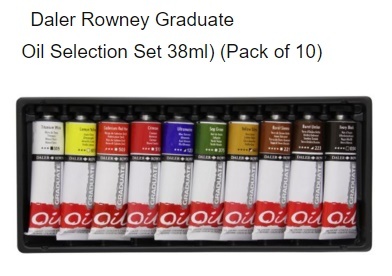 Daler Rowney Graduate Oil Selection Set. Within you will find: lemon yellow, cadmium red (hue), crimson, ultramarine, sap green, yellow ochre, burnt sienna, burnt umber, ivory black and titanium white. Issues: There is no primary red. Both cadmium red and crimson contain yellow to some degree. Sap green, ivory black and yellow ochre are not needed – unless you want to mix dirty colors. The tube of white is the same size as the other pigments. Within you will find: lemon yellow, cadmium yellow hue, yellow ochre, burnt sienna, cadmium red hue, alizarin crimson, French ultramarine, sap green, lamp black and titanium white. Issues: Yellow ochre, sap green and lamp black are not needed unless you like dirty colors. There is no primary blue, so mixing a clean green will be virtually impossible. The tube of white is the same size as the other colors. Within you will find: lemon yellow, cadmium yellow, cadmium red (deep), alizarin crimson, ultramarine, cerulean blue, pthalo green, yellow ochre, burnt umber, titanium white. Issues: Yellow ochre. It is not needed. Titanium white is the same tube size as the other pigments. Mixing a clean violet may be tricky, as cadmium red (deep) is the closest approximation to a primary red. Other than that, the pigment is not too bad compared to the artist kits. Within you will find: cadmium yellow pale hue, cadmium red deep hue, French ultramarine, phthalo blue, viridian hue, permanent green light, yellow ochre, burnt sienna, ivory black and titanium white. Issues: Permanent green light, yellow ochre and ivory black are not needed. With such as limited choice of colors, every pigment should be made to count. Titanium white is the same size tube as the other pigments. Secondary colors will be possible but not the cleanest, most vibrant sort. Quite a few colors here will remain relatively unused. 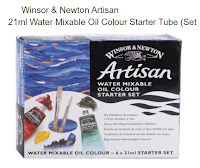 Within you will find: permanent alizarin crimson, cadmium yellow, phthalo green-blue shade, French ultramarine, yellow ochre and titanium white. Issues: yellow ochre is not a vital pigment, unless dirty colors are the aim. Titanium white is the same size as the other pigments. Other than that, not a bad selection compared to the others. I will often select my own art pigments individually rather than purchase a box of pigments. would recommend lemon yellow, cadmium yellow (pale), cadmium red, permanent rose (quite close to magenta, but don’t buy art tubes labeled ‘magenta’ as this may contain impurities). 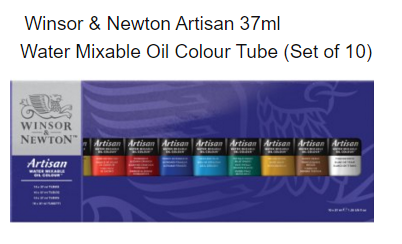 Also recommended are ultramarine, pthalo blue (or cerulean). Both have some properties of cyan. Finally, I find burnt sienna and burnt umber creates warm, rich neutrals and darks. And finally, a big tube of titanium white. Luxuries are alizarin crimson (and old favorite) and viridian green. Yes, criticized for its overuse in painting foliage, but it can be tempered with other colors to create lovely greens. Some pigment manufacturers sell pigments with the word ‘process’ or ‘permanent’ to denote a color close to the true primary color, for instance, ‘permanent blue’ will resemble ‘cyan’ of printing ink, a true primary color.